A good reporter is always supposed to ask five questions: “who, what, when, where and why?” A new report on ride-hailing provides a range of keen insights about the demand for these services, and has important implications for predicting the future of autonomous vehicles. There’s a new report from Shared Use Mobility Center, published by the Transportation Research Board, with a ponderous title: “Broadening Understanding of the Interplay Between Public Transit, Shared Mobility, and Personal Automobiles. The report is a over a hundred pages long, and filled with interesting and often arcane detail about who’s using services like Lyft and Uber, where and when they use them and how this is affecting demand for street space and transit. If you’re a real transportation geek, you’ll want to read the whole thing. But if you aren’t (or in the meantime, until you’ve had a chance to read it) we can boil the whole thing down to five words: drinking, parking, flying, peaking and pricing. 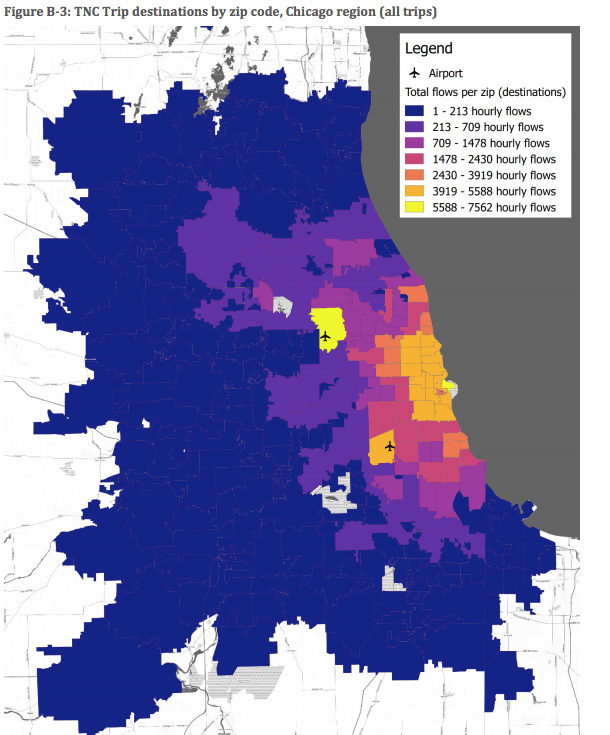 The heart of the work is an analysis of trip-making data supplied by ride hailing companies, similar data collected in San Francisco, and surveys of more than 10,000 customers of ride-haling services in five cities: Chicago, Los Angeles, Nashville, Seattle and Washington, DC. The study also explored the question of whether use of ride-hailing services had any impact on transit ridership in these cities. 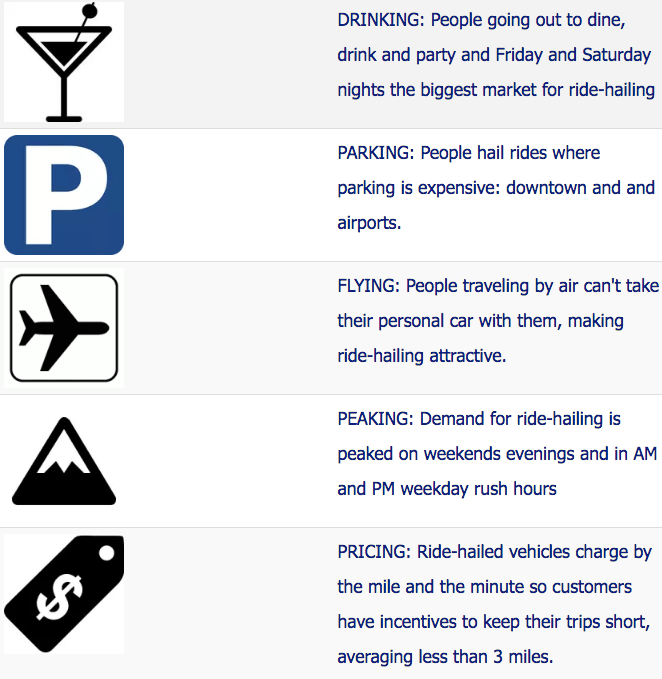 The slightly longer narrative take on the report is this: Ride-hail demand is driven by drinking (people who want to avoid having drive their own vehicle on Friday and Saturday nights), by the cost of parking (ride-hailing is a more economical alternative to bringing your own car places where parking is expensive). People traveling by air seem to value their time more highly, and may have no access to a personal private vehicle at one end of their flight. Ride-hailing is highly peaked in those times (especially Friday and Saturday nights) and places (downtowns and airports) in which there is demand. Finally, ride hail trips tend to be short (just 2-4 miles), because customers pay for each additional mile and minute. The report also tells us a lot about where these services aren’t valued. There’s little demand for ride-hailing when parking is cheap or free, when drivers expect to be sober, and for longer trips, and to destinations that don’t have a high density of people and destinations (or an airport). There’s a strong economic implication here: The income and value of time of travelers, and the availability and price of alternatives figures prominently in when, where and whether people use ride-hailing services. The risks and penalties associated with drunk driving (legal, financial and moral) likely lead many people to choose ride-hailing when they consume alcohol; in addition unlike journey to work trips, social trips may be groups rather than individuals. People use ride-hailing services “on an occasional basis” and for trips where speed and reliability are important. Few people use it for commuting on a regular basis. What this suggests is that the markets for ride-hailed vehicles today–and for their successors, fleets of autonomous vehicles tomorrow–are likely to be shaped by many of these same factors. Demand will be highest where people, and trip origins and destinations are densest, where parking is expensive, where and among populations that have a high value of travel time savings (and the ability to pay). Ride-hailing and autonomous vehicles are going to affect some people, some trips, and some places much more than others. The content of this report is an excellent addition to our knowledge about ride-hailing and its place in the urban transportation system. It’s a shame that much of the most salient content and its implications are buried in the report. (Just a thought: starting the title of your report with the words “broadening understanding of the interplay” is not an attention-grabber). More tangibly, while the report’s data implicate parking costs as a key factor in ride-hailing demand, that observation isn’t made in the report and the word parking appears on just 6 of the report’s more than 100 pages. We’ve tried to punch up the findings a bit so that the meat of this report gets the attention we think it deserves.